Challenging CubeSat missions have begun to concentrate on scientific interplanetary exploration. The Moon in particular has become a target of interest to CubeSat developers, with the advance of multiple lunar CubeSat missions. However, the requirements of longer duration, higher reliability, and stronger robustness hinder the development of these CubeSats using commercial off-the-shelf (COTS) solutions. To address this issue, subsystem technologies and instruments obviously need to be improved, but developing a reliable system design approach is also urgent. This paper proposes a multidisciplinary design optimization (MDO) with particular attention to systematic uncertainty quantification for lunar CubeSats. The neglect of uncertainty effect has caused performance degradations, function faults, and even mission failures in quite a few previous low Earth orbit (LEO) CubeSats, which may be much worse in interplanetary cases. Considering uncertainty propagation in the system conceptual design can be the most effective way to enhance the robustness and reliability. The cost per unit of exploration information is the primary optimization objective, while satellite mass, installation volume, payload precision and other requirements are set as the constraints. To enable this highly nonlinear and closely coupled optimization, a system decoupling strategy and an active subspace approximation are combined for each search point. The key subsystem models of orbit, payload, propulsion, power, and data communication are established and their dominant uncertainties are quantified, including the cost model. The result of incorporating uncertainty analysis in the optimization loop is compared with the deterministic MDO, which verifies the feasibility and efficacy of uncertainty-based MDO. The preliminary design of an optimum 3U lunar CubeSat with 200 km low Lunar orbit (LLO) is obtained and the uncertainties that contribute the most to the objective variability are ranked, which provides a beneficial reference for practical CubeSat design and sensitive parameter control. 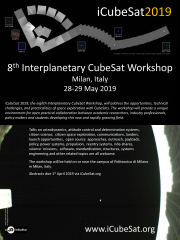 The uncertainty-based MDO approach and relevant models also offer a potential template to integrate subsystem technology developments for other interplanetary CubeSat architectures.